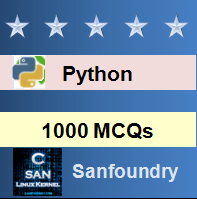 This set of Python Multiple Choice Questions & Answers (MCQs) focuses on “List Comprehension – 1”. 1. What is the output of the code shown? Explanation: In the code shown above, each of the numbers of the list, that is, 1, 2, 3, 4 and 5 are AND-ed with 1 and the result is printed in the form of a list. Hence the output is [1, 0, 1, 0, 1]. Explanation: The code shown above returns x*y, where x belongs to the list l1 and y belongs to the list l2. Therefore, the output is: [4, 5, 6, 8, 10, 12, 12, 15, 18]. 3. Write the list comprehension to pick out only negative integers from a given list ‘l’. Explanation: To pick out only the negative numbers from a given list ‘l’, the correct list comprehension statement would be: [x for x in l if x<0]. Explanation: If we need to generate two results, we need to put it in the form of a tuple. The code shown above returns each word of list in uppercase, along with the length of the word. Hence the output of the code is: [(‘PUNE’, 4), (‘MUMBAI’, 6), (‘DELHI’, 5)]. This format is due to the statement print(i). 7. Write a list comprehension for number and its cube for l=[1, 2, 3, 4, 5, 6, 7, 8, 9]. Explanation: The list comprehension to print a list of cube of the numbers for the given list is: [x**3 for x in l]. Explanation: In the code shown above, ‘3’ is the index of the list. Had we used a number greater than 3, it would result in an error. The output of this code is: [[1, 4, 7], [2, 5, 8], [3, 6, 9]]. Explanation: The list comprehension shown above rounds off pi(3.141) and returns its value, that is 3. This is done 5 times. Hence the output is: [‘3’, ‘3’, ‘3’, ‘3’, ‘3’]. This is due to the statement: print(x, y,z).